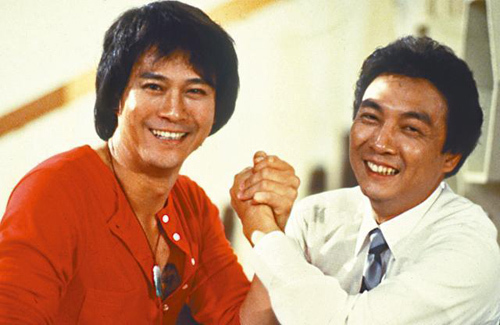 With the rebroadcast of The Greed of Man <大時代> breaking ratings records in Hong Kong, Damian Lau (劉松仁) and Adam Cheng‘s (鄭少秋) old rivalry rumors were once again brought to light. It was reported that Damian and Adam had a fallout for decades due to fighting for chances to collaborate with Liza Wang (汪明荃). Damian and Adam last worked together in 1992’s The Greed of Man. Damian admitted that he had rarely been in contact with Adam since then. On whether it was true that he had absented himself from the promotional event for The Greed of Man back then due to his dislike of Adam, Damian explained, “That was because I wasn’t even in Hong Kong at the time! I was in Canada and couldn’t make it for the event.” He then added that he would not be interested in reprising his role for a film version of The Greed of Man, if it were to be produced. If the reporters had seen how Damian and Adam interacted behind the scenes in the initial sales presentation for “The Conqueror’s Story” (before Damian had to pull out and Kwong Wah joined with a switch in roles), then they would not make up this ridiculous story and insult both these professional actors.